The Super Bowl. The Big Game. The NFL Championship Game. We are at T minus 5 days until kick off! Some of you Super fans are probably getting Super excited for this Super game. Others maybe not so much. Maybe your favorite football team isn't represented this year. Well don't be sad and glum. Don't pout. Whether or not you're a true football fanatic all season long or just like to get caught up in the spirit and excitement of the final game of the season there are more things to enjoy on Super Bowl Sunday than just the action on the field. First of all there are those highly anticipated commercials! Plenty of folks watch the game primarily for these creative (and expensive!) nuggets and subsequently enjoy engaging in post game discussion of their favorites around the water cooler for days on end! Secondly, who could forget the Puppy Bowl with all its cute little furry four-legged football players and their antics? Awwwwww! 'Nuff said. Thirdly is the food! Tables full of hot and cold finger foods, burgers, hot dogs, chili, chips & dip are usually king when it comes to the eats. It's the second biggest eating day of the year (Thanksgiving is #1). Better get out the stretchy pants! 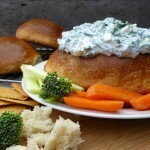 Our Homemade Bread Bowls would be absolutely perfect for serving game day dips or chili or feel free to check out any of our other Game Day Food recipes for inspiration. We like the classic Spinach Dip in our bread bowl with extra chunks of bread, raw veggies or crackers as dippers. The Big Game is the perfect excuse and opportunity to gather friends and family together around screens large or small for a fabulous time and some tasty food and drink. With a little bit of planning you can pull off the perfect pigskin bash! Are you thinking of having a party or attending one? Having your own personal chow down at home where you can hog the entire table of snacks and beverages for yourself? Whatever your choice and whomever you root for Sweet and Savory Breads wishes you a Super Sunday and may YOUR team win! 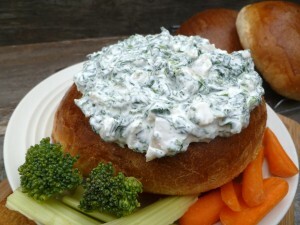 Homemade bread bowls are ideal for serving your favorite hearty soups or party dips. In a large mixer bowl combine 2 1/2 cups warm water with the yeast and sugar and allow to stand 10 minutes. Add the oil, salt and 1 1/2 cups flour and mix on low speed until moistened. Attach dough hook and start adding additional flour one cup at a time for a total of 5 cups. Increase speed to medium/low and continue adding flour 1/2 cup at a time until the dough starts to pull away from the sides of the bowl. Do not add more than 7 cups total. Continue to knead with mixer an additional 6 minutes. You may also knead by hand on a surface lightly dusted with flour. Lightly oil a large bowl. Shape the dough into a ball and place in the bowl turning over once to coat with oil. Cover with a clean dishtowel and allow to rise in a warm, draft free place until doubled. Lightly grease a large baking sheet and sprinkle with cornmeal. Set aside. 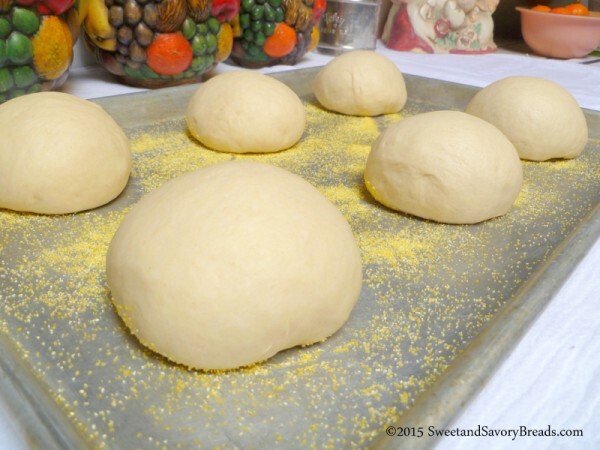 Punch the dough down and divide into 6 equal pieces. Shape each piece into a smooth ball pulling the sides down and under with palms of the hands. Pinch edges together underneath and place on the prepared baking sheet. Cover with towel and allow to rise until doubled. Preheat oven to 400 degrees F. In a small bowl combine the egg white and 1 Tablespoon of water. Brush half the mixture on the top of the dough balls. Bake for 15 minutes then brush the remaining egg wash over and continue baking for 15 additional minutes until golden brown. Your oven may vary. Remove from the oven and allow to cool enough to handle. To make bowls for soup or dip, slice off the top 1/2 inch with a serrated knife. Using your hands, scoop out the interior leaving approximately 3/4 inch shell. Reserve the centers for another use such as bread crumbs or croutons. Fill bowls with hot soup or your favorite dip and enjoy! 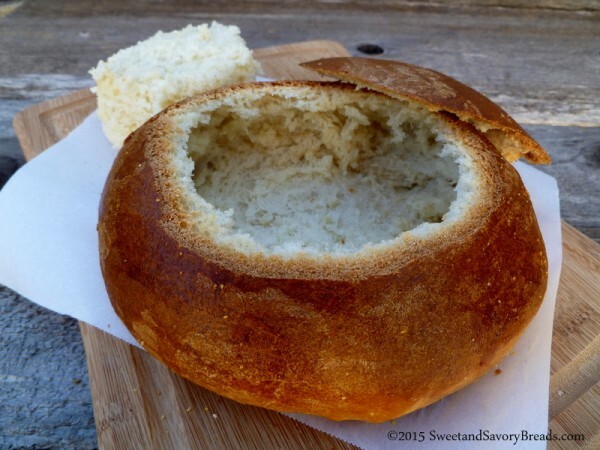 These homemade bread bowls hold approximately 1 1/2 cups of soup or dip. Leftovers may be frozen or wrapped tightly and kept three days. Try toasting the lid and serve on the side with the soup. 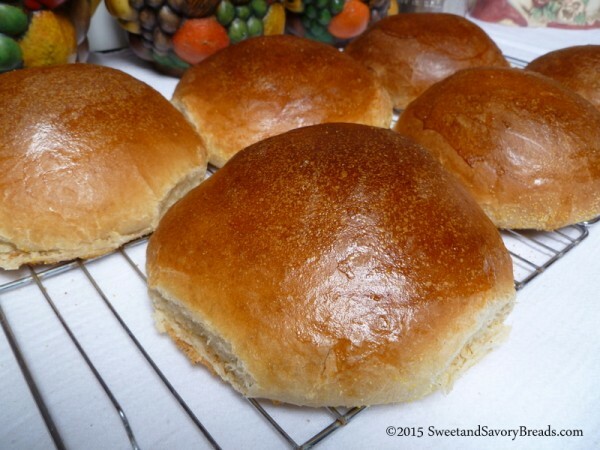 Posted in Game Day Party Recipes, Yeast BreadsTagged Appetizer, bread, Finger Food, Game Day FoodBookmark the permalink.